For the past couple years I've been working with a customer out in San Diego. Prior to my first trip out there, I recalled a vacation we took in the area a few years back and the great wine prices on wine we found at a Costco in Carlsbad, so I thought to check an area Costco while I was out there. I got lost along the way and instead discovered San Diego Wine Co. That random act guided me to one of my favorite wine shops in the country. Innocently situated in a strip mall near the Mirimar Naval Air Station, San Diego Wine Co keeps things simple. No fancy racks, or any racks at all for that matter: Wines are displayed mostly in the cardboard boxes they came in. They focus on popular categories like Napa Cabernet, domestic Pinot Noir, France and Italy. The wines they select in those categories tend to be highly rated by publications like Wine Spectator and hard to find -or- delicious crowd pleasers -or- small production California wineries I've never heard of before. The common denominator in the wines they select is that they offer them at unbeatable prices. 93 WS/$28 Release Price/$26.95 at San Diego Wine Co. Fantastic wine- thoroughly enjoyed it. 95WS on the '06/$40 Release Price/$31.95 at San Diego Wine Co.
Update: I did a more comprehensive tasting of the '06 and '07 Coho Headwaters. Click here to have a look. Best Price in MA: $39/$29.95 at San Diego Wine Co.
Corked. Bummer. I didn't have time to take it back (though I'm always in favor of returning corked wine). Really saddened by this after enjoying the Gaja Sito Moresco so so much. 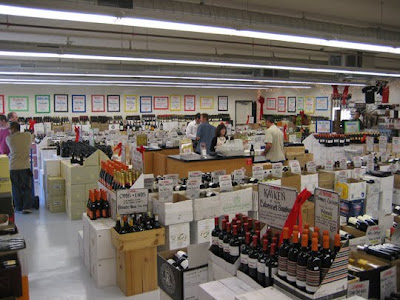 If you're in Massachusetts, visit Wine ConneXtion in North Andover. Why? Because their business model is the closest I've seen in the state. Question of the Day: Why are wine prices so much higher in Massachusetts than California for wines from freaking Italy! ?